A group of Canadian astronomers may have the first picture of a planet circling a star other than our Sun, reports National Geographic. 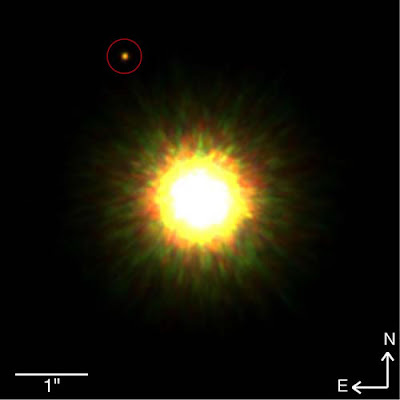 Further observation is needed to confirm the object (probably a gas giant 8-times the size of Jupiter) is actually circling the star it’s photographed next to. If this turns out to be the real deal, this is a big step in exo-planetary exploration. Until now, discovery of planets circling other stars has been a bit abstract. Basically, a “discovery” is made when scientists detect tiny wobbles in a star’s rotation. In theory, the wobble is caused by a circling planet’s own gravity. And then using spectral analysis, scientists can learn more details about the planet (for example, the composition of its atmosphere).